This article is about the history and function of the Danish monarchy as an institution. For the kingdom of Denmark itself, see Denmark. "Queen of Denmark" redirects here. For other uses, see Queen of Denmark (disambiguation). The Monarchy of Denmark, colloquially known as the Danish Monarchy, is a constitutional institution and a historic office of the Kingdom of Denmark. The Kingdom includes not only Denmark, but the autonomous regions of Greenland and the Faroe Islands. The Kingdom of Denmark were already consolidated in the 8th century, whose rulers are consistently referred to in Frankish sources (and in some late Frisian sources) as Kings (Reges). Under the rule of King Gudfred in 804 the Kingdom may have included all the major provinces of medieval Denmark The current unified kingdom of Denmark was founded by the Viking kings Gorm the Old and Harald Bluetooth in the 10th century, making the monarchy of Denmark the third oldest in Europe. Originally an elective monarchy, it became hereditary only in the 17th century during the reign of Frederick III. A decisive transition to a constitutional monarchy occurred in 1849 with the writing of the first Constitution. The current Royal House is a branch of the princely family of Glücksburg, originally from Schleswig-Holstein in modern-day Germany, the same royal house as the Norwegian and former Greek royal families. The Danish Monarchy is constitutional and as such, the role of the monarch is defined and limited by the Constitution of Denmark. According to the constitution, the ultimate executive authority over the government of Denmark is still by and through the monarch's royal reserve powers; in practice these powers are only used according to laws enacted in Parliament or within the constraints of convention. The monarch is, in practice, limited to non-partisan functions such as bestowing honours and appointing the Prime Minister. The monarch and his or her immediate family undertake various official, ceremonial, diplomatic and representational duties. Queen Margrethe II ascended the throne on the death of her father, King Frederick IX, on 14 January 1972. 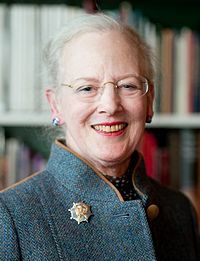 On her accession, Queen Margrethe II became the first female monarch of Denmark since Margrethe I, ruler of the Scandinavian countries in 1375‒1412, during the Kalmar Union. 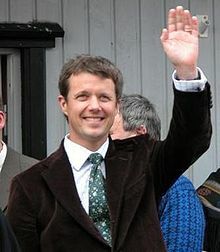 Danish regnal names have traditionally (since 1513) alternated between "Frederick" (Frederik) and "Christian"; Margrethe has taken the place of a Christian, and accordingly her heir apparent is Crown Prince Frederik. One of the two Jelling stones, attesting to Harald Bluetooth's unification and Christianization of Denmark. The Danish monarchy is over 1000 years old, founded in 935, making it the third oldest continuous monarchy in Europe (the oldest is Scotland founded in 834 followed by Norway in 872) and fourth in the world still existing today, the oldest being the Imperial House of Japan. The line of kings of the modern kingdom of Denmark can be traced back to Harthacnut father of Gorm the Old (Gorm den Gamle), who reigned in the early 10th century. The kingdom itself though is probably a couple of hundred years older than that. The Danes were united (or more likely reunited) and officially Christianized in 965 CE by Harald Bluetooth, the story of which is recorded on the Jelling stones. The exact extent of Harald's kingdom is unknown, although it is reasonable to believe that it stretched from the defensive line of Dannevirke, including the Viking city of Hedeby, across Jutland, the Danish isles and into southern present day Sweden; Scania and perhaps Halland. 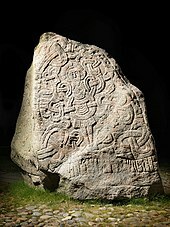 Furthermore, the Jelling stones attests that Harald had also "won" Norway. The son of Harald, Sweyn Forkbeard, mounted a series of wars of conquest against England, which was completed by Sweyn's son Cnut the Great by the middle of the eleventh century. The reign of Cnut represented the peak of the Danish Viking age; his North Sea Empire included England (1016), Denmark (1018), Norway (1028) and held strong influence over the north-eastern coast of Germany. The last monarch descended from Valdemar IV, Christopher III of Denmark, died in 1448. Count Christian of Oldenburg, descendant of Valdemar IV's aunt Richeza, was chosen as his successor and became the next monarch of Denmark, ruling under the name Christian I. 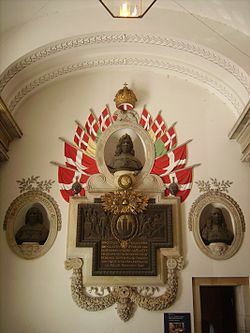 Memorial inside Christiansborg Palace. Depicted is Frederick III and the event commemorated is the failed Swedish attack on Copenhagen in 1659. Originally the Danish monarchy was elective, but in practice the eldest son of the reigning monarch was elected. Later a Coronation Charter was signed by the king to restrict the powers of the Danish monarch. In 1657, during the Second Northern War, King Frederick III launched a war of revenge against Sweden which turned into a complete disaster. The war became a disaster for two reasons: Primarily, because Denmark's new powerful ally, the Netherlands, remained neutral as Denmark was the aggressor and Sweden the defender. Secondly, the Belts froze over in a rare occurrence during the winter of 1657-1658, allowing King Charles X Gustav of Sweden to lead his armies across the ice to invade Zealand. In the following Treaty of Roskilde, Denmark–Norway capitulated and gave up all of Eastern Denmark (i.e. Skåne, Halland, Blekinge and Bornholm), in addition to the counties of Bohuslän and Trøndelag in Norway. But the Second Northern War was not yet over. Three months after the peace treaty was signed, Charles X Gustav held a council of war where he decided to simply wipe Denmark from the map and unite all of Scandinavia under his rule. Once again the Swedish army arrived outside Copenhagen. However, this time the Danes did not panic or surrender. Instead, they decided to fight and prepared to defend Copenhagen. Frederick III had stayed in his capital and now encouraged the citizens of Copenhagen to resist the Swedes, by saying he would "die in his nest", rather than to evacuate to safety in Norway. Furthermore, this unprovoked declaration of war by Sweden finally triggered the alliance that Denmark–Norway had with the Netherlands, and a powerful Dutch fleet was sent to Copenhagen with vital supplies and reinforcements, which saved the city from being captured during the Swedish attack. Charles X Gustav suddenly died of an illness in early 1660, while planning an invasion of Norway. Following his death, Sweden made peace in the Treaty of Copenhagen. The Swedes returned Trøndelag to Norway and Bornholm to Denmark, but kept the other territories gained two years earlier. The Netherlands and other European powers accepted the settlement, not wanting both coasts of the Sound controlled by Denmark. This treaty established the boundaries between Norway, Denmark, and Sweden that still exist today. Absolutism was introduced in 1660–1661 and the elective monarchy was de jure transformed into an hereditary monarchy. Male primogeniture succession was laid down in law in the Royal Decree of 1665. During the German occupation of World War II, King Christian X became a powerful symbol of national identity. This image dates from the King's birthday, 26 September 1940. When he succeeded to the throne in January 1848, King Frederick VII was almost at once met by the demands for a constitution and an end to absolutism. The Schleswig-Holsteiners wanted an independent state while the Danes wished to maintain South Jutland as a Danish area. Frederick VII soon yielded to the Danish demands, and in March he accepted the end of absolutism, which resulted in the June Constitution of 1849. During the First War of Schleswig against the German powers in 1848–51, Frederick appeared as ”the national leader” and was regarded almost as a war hero, despite having never taken any active part in the struggles. On 5 June 1849 the constitution, known as the June Constitution, was altered to create the framework of a constitutional monarchy for Denmark. As King Frederick VII was without legitimate issue, Prince Christian of Glücksborg was chosen in 1853 as heir presumptive to the Danish throne, with the approval of the great powers of Europe, in light of the expected extinction of the senior line of the House of Oldenburg. A justification for this choice was his marriage to Louise of Hesse-Kassel, who as a niece of Christian VIII, was a more close relative to the incumbent king than her husband. Upon the death of King Frederick VII of Denmark in 1863, Christian IX acceded to the throne as the first Danish monarch of the House of Glücksburg. Christian IX eventually became known as Father-in-law of Europe due to his family ties with most other ruling dynasties of Europe: His daughter Princess Alexandra married Edward VII of the United Kingdom, another daughter Princess Dagmar married Alexander III of Russia and Princess Thyra married Crown Prince Ernst August of Hanover. His son Vilhelm went on to become George I of Greece. Further, his grandson Carl became Haakon VII of Norway. To this day the Danish Royal Family are related to most other reigning European dynasties. The Easter Crisis of 1920 was a constitutional crisis which began with the dismissal of the elected government by King Christian X, a reserve power which was granted to him by the Danish constitution. The immediate cause was a conflict between the king and the cabinet over the reunification with Denmark of Schleswig, a former Danish fiefdom which had been lost to Prussia during the Second War of Schleswig. According to the terms of the Treaty of Versailles, the disposition of Schleswig was to be determined by two Schleswig Plebiscites: one in Northern Schleswig (today Denmark's South Jutland County), the other in Central Schleswig (today part of the German state of Schleswig-Holstein). Many Danish nationalists felt that Central Schleswig should be returned to Denmark regardless of the plebiscite's results, generally motivated by a desire to see Germany permanently weakened in the future. Christian X agreed with these sentiments, and ordered Prime Minister Carl Theodor Zahle to include Central Schleswig in the re-unification process. As Denmark had been operating as a parliamentary democracy since the Cabinet of Deuntzer in 1901, Zahle felt he was under no obligation to comply. He refused the order and resigned several days later after a heated exchange with the king. Subsequently, Christian X dismissed the rest of the government and replaced it with a de facto conservative care-taker cabinet under Otto Liebe. The dismissal caused demonstrations and an almost revolutionary atmosphere in Denmark, and for several days the future of the monarchy seemed very much in doubt. In light of this, negotiations were opened between the king and members of the Social Democrats. Faced with the potential overthrow of the Danish monarchy, Christian X backed down and dismissed his own government. This was the most recent time that a sitting Danish monarch made an executive decision without the support of a cabinet accountable to the legislature; following the crisis, Christian X accepted his drastically reduced role as symbolic head of state. The Act of Succession of 27 March 1953 was promulgated after a 1953 referendum introduced the possibility of female succession and, in effect, made the current Queen regnant, Margrethe II, the heir presumptive and eventual successor to her father, Frederick IX upon his death in 1972, rather than her uncle Prince Knud. Following a referendum in 2009, the Act of Succession was amended so that primogeniture no longer puts males over females. In other words, the first-born child would become heir to the throne regardless of gender. 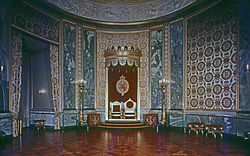 The Throne Room at Christiansborg Palace is where foreign ambassadors present their credentials to the Queen. According to the Danish Constitution, the Danish Monarch, as the de facto head of state, is the holder of executive and, jointly with the Folketing, legislative power. The Monarch has the ability to deny giving a bill royal assent as well as to choose and dismiss the Prime Minister or any Minister of Government with or without cause; however, no Monarch has exercised the latter powers since King Christian X dismissed the government on 28 March 1920, sparking the 1920 Easter Crisis. 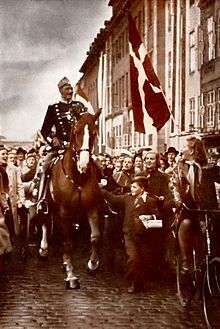 However, when reading the Danish Constitution of 1953, it is important to bear in mind that the usage of the word king, in the context of exercising acts of state, is understood by Danish jurists to be read as the Government (consisting of the Prime Minister and other ministers). This is a logical consequence of articles 12, 13 and 14, all of which in essence stipulate that the powers vested in the monarch can only be exercised through ministers, who are responsible for all acts, thus removing any political or legal liability from the Monarch. Today the Queen delegates much royal authority to Ministers in government, allowing the Queen to engage in the ceremonial role outlined by the Danish constitution. The Prime Minister and Cabinet attend the regular meetings of the Council of State, at which the Monarch presides and gives royal assent to laws. The Prime Minister and the Minister of Foreign Affairs report regularly to the Queen to advise her of the latest political developments. The Queen hosts official visits by foreign Heads of State, pays state visits abroad, receives letters of credence from foreign ambassadors and signs those of Danish ambassadors. The convention for appointment of a new prime minister after a general election is that after consultation with representatives of the political parties, the Queen invites the party leader who has the support of the largest number of seats in the Folketing to form a government. Once it has been formed, the Queen formally appoints it. Greenland and the Faroe Islands are two Danish dependencies which enjoy Home-rule and their head of state is also the monarch of Denmark, in accordance with the Danish Constitution. After a referendum in Greenland in 2009, the Danish Parliament implemented a new Danish Law called Act on Greenlandic Self-rule, which, unlike any other case with the Indigenous Peoples around the world, acknowledges Greenlanders as a people in accordance to the International Law, and hereby giving the Greenlanders ability to obtain sovereignty. Denmark has had absolute primogeniture since 2009. The Danish Act of Succession adopted on 27 March 1953 restricts the throne to those descended from King Christian X and his wife, Alexandrine of Mecklenburg-Schwerin, through approved marriages. Dynasts lose their right to the throne if they marry without the permission of the monarch given in the Council of State. Individuals born to unmarried dynasts or to former dynasts that married without royal permission, and their descendants, are excluded from the throne. Further, when approving a marriage, the monarch can impose conditions that must be met in order for any resulting offspring to have succession rights. Part II, Section 9 of the Danish Constitution of 5 June 1953 provides that the parliament will elect a king and determine a new line of succession should a situation arise where there are no eligible descendants of King Christian X and Queen Alexandrine. The monarch of Denmark must be a member of the Danish National Church, or Evangelical Lutheran Church of Denmark (Danish Constitution, II,6). The National Church is by law the State Church, though the monarch is not its head. Princes and princesses in the line of succession use the style prince/princess to Denmark, where all those not in line use the style prince/princess of Denmark. The first law governing the succession to the Danish throne as a hereditary monarchy was the Kongeloven (Latin: Lex Regia), enacted 14 November 1665, and published in 1709. It declared that the crown of Denmark shall descend by heredity to the legitimate descendants of King Frederick III, and that the order of succession shall follow semi-Salic primogeniture, according to which the crown is inherited by an heir, with preference among the Monarch's children to males over females; among siblings to the elder over the younger; and among Frederick III's remoter descendants by substitution, senior branches over junior branches. Female descendants were eligible to inherit the throne in the event there were no eligible surviving male dynasts born in the male line. As for the duchies, Holstein and Lauenburg where the King ruled as duke, these lands adhered to Salic law (meaning that only males could inherit the ducal throne), and by mutual agreement were permanently conjoined. The duchies of Schleswig (a Danish fief), Holstein and Lauenburg (German fiefs) were joined in personal union with the Crown of Denmark. This difference caused problems when Frederick VII of Denmark proved childless, making a change in dynasty imminent, and causing the lines of succession for the duchies on one hand and for Denmark on the other to diverge. That meant that the new King of Denmark would not also be the new Duke of Schleswig or Duke of Holstein. To ensure the continued adhesion of the Elbe duchies to the Danish Crown, the line of succession to the duchies was modified in the London Protocol of 1852, which designated Prince Christian IX of Schleswig-Holstein-Sonderburg-Glücksburg, as the new heir apparent, although he was, strictly, the heir neither to the Crown of Denmark nor to the Duchies of Schleswig, Holstein or Lauenburg by primogeniture. Originally, the Danish prime minister Christian Albrecht Bluhme wanted to keep the separate hereditary principles, but in the end the government decided on a uniform agnatic primogeniture, which was accepted by the Parliament. This order of succession remained in effect for a hundred years, then the Salic law was changed to male-preference primogeniture in 1953, meaning that females could inherit, but only if they had no brothers. In 2009, the mode of inheritance of the throne was once more changed, this time into an absolute primogeniture. Following the transformation of Denmark's monarchy from elective (at least theoretically, although it had generally descended to the eldest son of the House of Oldenburg since 1448) to hereditary in 1660, the so-called Kongelov (Latin: Lex Regia) established the right to rule "by the grace of God" for King Frederick III and his posterity. Out of the articles in this law, all except for Article 21 and Article 25 have since been repealed. Article 21 states "No Prince of the Blood, who resides here in the Realm and in Our territory, shall marry, or leave the Country, or take service under foreign Masters, unless he receives Permission from the King". Under this provision, princes of Denmark who permanently reside in other realms by express permission of the Danish Crown (i.e. 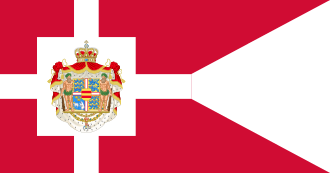 members of the dynasties of Greece, Norway and the United Kingdom) do not thereby forfeit their royalty in Denmark, nor are they bound to obtain prior permission to travel abroad or to marry from its sovereign, although since 1950 those not descended in male-line from King Christian IX are no longer in the line of succession to the Danish throne. However, those who do reside in Denmark or its territories continue to require the monarch's prior permission to travel abroad and to marry. Article 25 of the Kongelov stipulates, with respect to members of the Royal dynasty: "They should answer to no Magistrate Judges, but their first and last Judge shall be the King, or to whomsoever He decrees." Although all other articles of the Kongelov have been repealed by amendments to the Constitution in 1849, 1853 and 1953, these two articles have thus far been left intact. The royal palaces of Denmark became property of the state with the introduction of the constitutional monarchy in 1849. Since then, a varying number of these has been put at the disposal of the monarchy. The agreement on which is renewed at the accession of every new monarch. Amalienborg Palace, the monarch's principal residence. The monarch has the use of the four palaces at Amalienborg in Copenhagen as a residence and work palace. Currently, the Queen herself resides in Christian IX's Palace and the Crown Prince in Frederik VIII's Palace. Christian VIII's Palace has apartments for other members of the royal family, whereas Christian VII's Palace is used for official events and to accommodate guests. Amalienborg was originally built in the 1750s by architect Nicolai Eigtved for four noble families; however, when Christiansborg Palace burned in 1794, the royal family bought the palaces and moved in. The state rooms of Christian VIII's Palace and Christian VII's Palace may be visited by the public on guided tours. Christiansborg Palace, site of many official functions of the monarch. In addition, parts of Christiansborg Palace in Copenhagen is also at the disposal of the monarch. It is the site of official functions such as banquets, state dinners, diplomatic accreditations, public audiences, meetings of the Council of State, receptions, royal christenings, lyings-in-state and other ceremonies. Also, the Royal Stables which provide the ceremonial transport by horse-drawn carriage for the royal family, is located here. The present building, the third with this name, is the last in a series of successive castles and palaces constructed on the same site since the erection of the first castle in 1167. The palace today bears witness to three eras of architecture, as the result of two serious fires in 1794 and in 1884. The main part of the current palace, finished in 1928, is in the historicist Neo-Baroque style. The chapel dates to 1826 and is in a Neoclassical style. The showgrounds were built 1738-46, in a Baroque style. The royal parts of the palace are open to the public when not in use. Fredensborg Palace, Spring and Autumn residence of the monarch. Another residence is Fredensborg Palace north of Copenhagen which is used principally in Spring and Autumn. It is often the site of state visits and ceremonial events in the royal family. The palace may be visited by the public on guided tours when not in use. In Jutland, Graasten Palace is at the disposal of the monarch. It was used as the summer residence of King Frederick IX and Queen Ingrid. Since the death of Queen Ingrid in 2000, the Queen has stayed at Graasten for a yearly vacation in summer. The hunting lodge the Eremitage Palace in the Dyrehaven deer park north of Copenhagen is used during royal hunts in Dyrehaven. Finally, Sorgenfri Palace is at the disposal of the monarch. It was the residence of Hereditary Prince Knud and Hereditary Princess Caroline Mathilde and is not in official use at all at this time. Apart from these state-owned palaces, Marselisborg Palace in Aarhus is privately owned by the Queen. It functions as the summer residence of the Queen, as well as during the Easter and Christmas holidays. In the Kingdom of Denmark all members of the ruling dynasty that hold the title Prince or Princess of Denmark are said to be members of the Danish Royal Family. As with other European monarchies, distinguishing who is a member of the national Royal Family is difficult due to lack of strict legal or formal definition of who is or is not a member. The Queen and her siblings belong to the House of Glücksburg, a branch of the House of Oldenburg. The Queen's children and male-line descendants belong agnatically to the family de Laborde de Monpezat. The Royal Family of Denmark during Queen Margrethe II's 70th birthday, 16 April 2010. Most members of the Greek Royal Family are members of the Danish Royal Family and bear the title of Prince or Princess of Greece and Denmark, as descendants of Christian IX of Denmark. Due to the morganatic status of her marriage, Marina, Consort of Prince Michael, and their children, Princesses Alexandra and Olga, are exceptions. The Danish Crown Regalia, all of which are on public display at Rosenborg Castle in Copenhagen: 1. Crown of Christian IV (1595); 2. Crown of Christian V (1665–70); 3. The Queen consort crown (1731); 4. Sceptre; 5. Sword of state; and, 6. Globus cruciger. The monarchs of Denmark have a long history of royal and noble titles. Historically Danish monarchs also used the titles 'King of the Wends' and 'King of the Goths'. Upon her accession to the throne in 1972 Queen Margrethe II abandoned all titles except the title 'Queen of Denmark'. The kings and queens of Denmark are addressed as 'Your Majesty', whereas princes and princesses are referred to as His or Her Royal Highness (Hans or Hendes Kongelige Højhed), or His or Her Highness (Hans or Hendes Højhed). Eric of Pomerania: By the Grace of God, King of Denmark, Sweden and Norway, the Wends and the Goths, Duke of Pomerania. Christopher of Bavaria: By the Grace of God, King of Denmark, Sweden and Norway, the Wends and the Goths, Count Palatine of the Rhine, Duke of Bavaria. The full title of the Danish sovereigns from Christian I to Christian II was: By the Grace of God, King of Denmark, Sweden and Norway, the Wends and the Goths, Duke of Schleswig, Holstein, Stormarn and Dithmarschen, Count of Oldenburg and Delmenhorst. The full title of the Danish sovereigns from Frederick I to Christian VII was: By the Grace of God, King of Denmark and Norway, the Wends and the Goths, Duke of Schleswig, Holstein, Stormarn and Dithmarschen, Count of Oldenburg and Delmenhorst. Oldenburg was elevated to a duchy during the reign of Christian VII, and the style was changed accordingly: By the Grace of God, King of Denmark and Norway, the Wends and the Goths, Duke of Schleswig, Holstein, Stormarn, Dithmarschen and Oldenburg. This style was used until his son, Frederick VI, lost control of Norway by the 1814 Treaty of Kiel. Frederick VI gained control over Rügen 1814–1815 leading to the style: By the Grace of God, King of Denmark, the Wends and the Goths, Prince of Rügen, Duke of Schleswig, Holstein, Stormarn, Dithmarschen and Oldenburg. In 1815, Frederick VI relinquished Rügen in favour of the Prussian king, and instead gained the Duchy of Lauenburg from the British-Hanoveran king leading to the style: By the Grace of God, King of Denmark, the Wends and the Goths, Duke of Schleswig, Holstein, Stormarn, Dithmarschen, Lauenburg and Oldenburg. This style was used until 1918 when Iceland was elevated to an independent state in union with Denmark. The full title of Christian X from 1918 to 1944: By the Grace of God, King of Denmark, Iceland, the Wends and the Goths, Duke of Schleswig, Holstein, Stormarn, Dithmarschen, Lauenburg and Oldenburg. When ascending the throne in 1972, Margrethe II abandoned all the monarch's traditional titles except the title to Denmark, hence her style By the Grace of God, Queen of Denmark. Royal Danish Ceremonial Car "Store Krone"
^ Berend, Nora (22 November 2007). "Christianization and the Rise of Christian Monarchy: Scandinavia, Central Europe and Rus' c.900–1200". Cambridge University Press – via Google Books. ^ "Den-Danske-Kongestamme". kongehuset.dk. Kongehuset. 2015. Retrieved 30 March 2015. ^ a b "The History of the Danish Monarchy". Danish monarchy. Archived from the original on 25 December 2008. Retrieved 16 December 2008. ^ "Monumenter i købstaden 1864 - 1920". dendigitalebyport.byhistorie.dk. ^ "Referendum: Succession amendment confirmed". ^ "My Constitution Act with Explanations 2013". Folketing. Archived from the original on 3 November 2013. Retrieved 10 January 2014. ^ "Tasks and Duties". Danish monarchy. Archived from the original on 25 December 2008. Retrieved 16 December 2008. ^ "Selvstyreloven - Lov om Grønlands Selvstyre - retsinformation.dk". www.retsinformation.dk. Retrieved 15 January 2016. ^ "ICL — Denmark — Succession to the Throne Act". Archived from the original on 30 May 2008. Retrieved 24 June 2008. ^ "Kongeloven". Statsministeriet. Statsministeriet. 4 September 1709. Archived from the original on 3 October 2013. Retrieved 21 November 2012. ^ "The Royal House". Danish monarchy. Archived from the original on 14 February 2010. Retrieved 16 December 2008. ^ "A Prince and a Princess are born". Archived from the original on 11 January 2011. ^ "Kronprinsesse Mary har født". Archived from the original on 17 March 2011. Christian IX was King of Denmark from 1863 until his death in 1906. From 1863 to 1864, he was concurrently Duke of Schleswig, Holstein and Lauenburg. Christian V was king of Denmark and Norway from 1670 until his death in 1699. Christian VII was a monarch of the House of Oldenburg who was King of Denmark–Norway and Duke of Schleswig and Holstein from 1766 until his death. For his motto he chose: "Gloria ex amore patriae". Frederick VIII was King of Denmark from 1906 to 1912. Frederick VII was King of Denmark from 1848 to 1863. He was the last Danish monarch of the older Royal branch of the House of Oldenburg and also the last king of Denmark to rule as an absolute monarch. During his reign, he signed a constitution that established a Danish parliament and made the country a constitutional monarchy. Frederick's motto was Folkets Kærlighed, min Styrke . Christian I was a Scandinavian monarch under the Kalmar Union. He was King of Denmark (1448–1481), Norway (1450–1481) and Sweden (1457–1464). From 1460 to 1481, he was also Duke of Schleswig and Count of Holstein. He was the first Danish monarch of the House of Oldenburg. Christian VI was King of Denmark and Norway from 1730 to 1746. The eldest surviving son of King Frederick IV and Louise of Mecklenburg-Güstrow, he is considered one of Denmark-Norway's more anonymous kings, but he was a skilled politician, best known for his authoritarian regime. 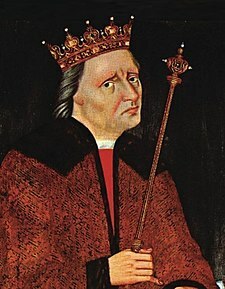 He was the first king of the Oldenburg dynasty to refrain from entering in any war. He was married to Sophie Magdalene of Brandenburg-Kulmbach and was the father of Frederick V. His chosen motto was "deo et populo". Frederick IV was the king of Denmark and Norway from 1699 until his death. Frederick was the son of King Christian V of Denmark-Norway and his consort Charlotte Amalie of Hesse-Kassel. Frederick V was king of Denmark–Norway and Duke of Schleswig-Holstein from 1746 until his death. He was the son of Christian VI of Denmark and Sophie Magdalene of Brandenburg-Kulmbach. The history of Schleswig-Holstein consists of the corpus of facts since the pre-history times until the modern establishing of the Schleswig-Holstein state. The House of Glücksburg, shortened from House of Schleswig-Holstein-Sonderburg-Glücksburg, is a Dano-German branch of the House of Oldenburg, members of which have reigned at various times in Denmark, Norway, Greece and several northern German states. Holstein-Gottorp or Schleswig-Holstein-Gottorp is the historiographical name, as well as contemporary shorthand name, for the parts of the duchies of Schleswig and Holstein, also known as Ducal Holstein, that were ruled by the dukes of Schleswig-Holstein-Gottorp. Other parts of the duchies were ruled by the kings of Denmark. The House of Oldenburg is a European dynasty of North German origin. It is one of Europe's most influential royal houses, with branches that rule or have ruled in Denmark, Iceland, Greece, Norway, Russia, Sweden, Schleswig, Holstein, and Oldenburg. The current Queen of Denmark and King of Norway, the former King of Greece, the consort of the monarch of the United Kingdom, as well as the first thirteen persons in the line of succession to the British throne, are all patrilineal members of the Glücksburg branch of this house. 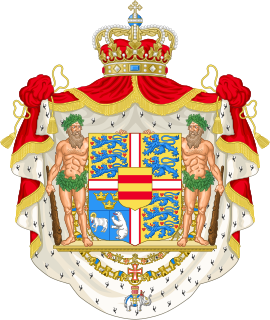 The Danish Act of Succession, adopted on 27 March 1953, restricts the throne to those descended from Christian X and his wife, Alexandrine of Mecklenburg-Schwerin, through approved marriages. Succession is governed by absolute primogeniture. The Danish royal family is the dynastic family of the monarch. All members of the Danish royal family except Queen Margrethe II hold the title of Prince/Princess of Denmark. Dynastic children of the monarch and of the heir apparent are accorded the style of His/Her Royal Highness, while other members of the dynasty are addressed as His/Her Highness. The Queen is styled Her Majesty. Louise of Hesse-Kassel was Queen of Denmark by marriage to King Christian IX of Denmark. The national coat of arms of Denmark consists of three pale blue lions passant wearing crowns, accompanied by nine red lilypads, all in a golden shield. It is historically the coat of arms of the House of Estridsen, the dynasty which provided the Kings of Denmark between 1047 and 1412. The current design was introduced in 1819, under Frederick VI. Previously, there had been no distinction between the "national" and the "royal" coat of arms. Since 1819, there has been a more complex royal coat of arms of Denmark (kongevåben) separate from the national coat of arms (rigsvåben). Christoph, Prince of Schleswig-Holstein has been the head of the House of Schleswig-Holstein-Sonderburg-Glücksburg and, by agnatic primogeniture, of the entire House of Oldenburg since 1980. He is the current titular Duke of Schleswig-Holstein and Duke of Glücksburg, traditionally styled as His Highness. He is a male-line descendant of Christian I of Denmark, and is also descended cognatically from numerous more recent monarchs, including Queen Victoria, Emperor Alexander II of Russia and several more recent Danish kings. The Monarchy of Iceland, was the system of government in which an hereditary monarch was the sovereign of the Kingdom of Iceland from 1918 to 1944. Under a personal union, due to the Act of Union, the monarch was simultaneously monarch of Denmark. The Parliament of Iceland asked that Denmark represent Iceland internationally, and day-to-day matters were delegated to a Danish plenipotentiary for Icelandic affairs based in Reykjavík, and – after the German invasion of Denmark in 1940 – a regent was appointed.